‘Mojito’ means ‘something wet’. It’s a perfect summer drink, long, cool, refreshing and sweet. Unsurprisingly, the mojito has it’s origins in the Caribbean, in Cuba, specifically. Legendary drinker Ernest Hemingway was a fan, and wrote “mi mojito en la Bodeguita”, which translates as ‘my mojito at the Bodeguita’, on the wall of his favourite Havana bar. Not his greatest literary work, but Hemingway’s graffiti is still there. Tip a teaspoon of white cane sugar into a highball glass and add a good squeeze of lime juice. Add a small handful of fresh mint leaves to the glass and gently mash them into the sugar using a fork or the handle of a wooden spoon. The idea is to gently pound the leaves so that they start to get bruised and release their essential oils. A bartender would use a special stick for this, called a ‘muddle’. You can just muddle* through with whatever’s to hand. Fill the glass nearly to the top with crushed ice and pour in 50ml of white rum. Let’s not kid ourselves here. You’re not going to measure it out, just give the bottle a nice, long pour. Mix everything around a little more, lifting the mint and sugar mix up into the ice and fill the glass up with soda water. Garnish with some more mint leaves and drink on a beach somewhere hot. *I’m sorry, I do apologise for that. It was uncalled for. I adore mojitos (well, anything with lime). And personally, I think I would have been disappointed if you'd not taken advantage of the muddle thing. 🙂 Cheers! Oh my gosh, that photo scrams refreshing! It looks incredibly crisp! It was good, very good. I'm neither a big cocktail maker or drinker, but those mojitos were very nice. that looks and sounds tasty! i love the command not to measure, just fill with rum. that's would make it a hemingway happy mojito 🙂 great post! Possibly the best drink EVER! Your looks just perfect! Okay, hilarious number one. Two, the drink looks fantastic. One of my all time favs. great pic! Man, I love mojitos and that one looks fantastic! That's a truly inspirational photo – if that doesn't send a shiver up the spine of a recovering alcoholic, then nothing will! 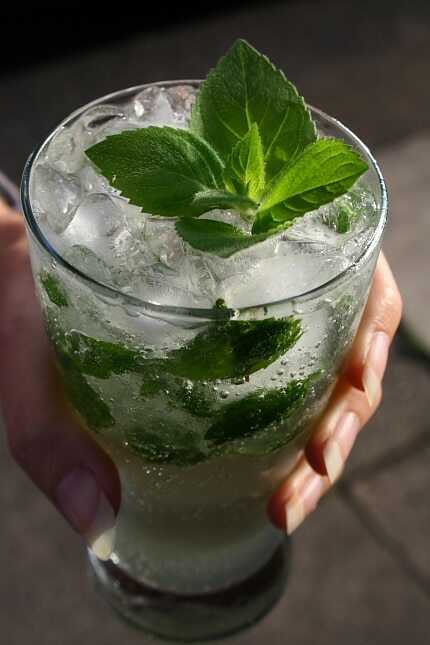 I'm quite partial to mojitos; at the risk of bastardising something close to perfection, i wonder what it would taste like if you used basil instead of mint? Now, I once had a mojito in a Wetherspoons establishment. It was vile. I might try and make one properly now that I know how. Then I can judge whether I like them or not. I love mojitos. They are so refreshing, sigh…. i want one !!! Great post!!!! Classic play on words. Think how funny it would be after a couple. I just messed around with a vodka gimlet last week. Used had infused basil vodka and it got my attention. After just coming in from digging drainage trenches, by hand, very hot work in this weather it wasn't the pigs head that got my attention but the cool, refreshing Mojito, oh how I could do with that just now!